An average suspension system consists of shock absorbers, control arm, frame and the steering linkage. These are the main components that can become faulty or damaged. Due to the amount of use the suspension gets, it can be prone to faults and in some cases accidental damage. Suspension is a vital part of your vehicle, it is important that it’s checked regularly and any faults are quickly repaired. There may be a problem with the steering and suspension system or driveline components if the car has uneven tyre wear, an off centre steering wheel, or the vehicle has a sway or drift while driving. We have certified technicians who will perform a professional inspection of the system, providing you with a complete analysis of the current conditions and repair cost estimate. Whenever we carry out a repair, we use the best diagnostic equipment available to ensure the fault is correctly identified. We then proceed with the repair using the correct tools and high-quality parts to ensure the work is reliable and long-lasting. Our mechanics are highly trained and have years of experience. They are able to repair a variety of faults that can occur with your suspension, and if we are unable to provide a repair we can always offer replacement parts. 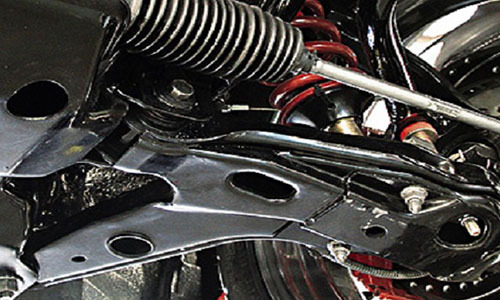 We provide cost-effective and professional repairs to all makes and models of car suspension. We keep large stocks of replacement parts to help us keep our turnaround time to a minimum. We pride ourselves on offering a simple and hassle-free service from start to finish, we can provide cost-effective repairs that are both reliable and carried out professionally.